(Lithia, FL – DATE, 2016) – CONCEPT Professional Training, a global leader in online professional training in forensic mental health, announced today that it has launched a new professional online training program called Evaluation of Risk for Sexual Violence Using the RSVP. 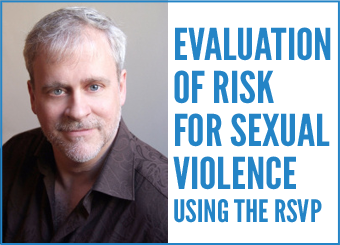 This training program on the Evaluation of Risk for Sexual Violence using the RSVP was developed by Dr. Stephen Hart and is presented in partnership with ProActive ReSolutions. Drs. Hart is an internationally recognized expert, prolific author, and engaging presenter. He is passionate about providing evidence-based understanding, knowledge and skills about violence risk assessment, threat assessment and management that professionals can apply in practice. The Risk for Sexual Violence Protocol (RSVP) is a set of structured professional guidelines that can also be considered a psychological test. In this Foundations of Threat Assessment training program, you will have an opportunity to learn new skills and build on existing skills in assessing and managing risk for violence. Not only will you learn about general principles of threat assessment and risk management, but also about best practices supported by researchers and practitioners around the world. The Evaluation Risk for Sexual Violence Using the RSVP training program is primarily for criminal justice, mental health, and victim support professionals – those who work with (alleged) perpetrators and victims of sexual violence. * Applying the RSVP to special issues, including: diversity (age, gender, and culture) and report writing and expert testimony. For more information on the Evaluation of Risk for Sexual Violence Program, visit here.